Nicki Minaj and Nas might be falling hard for each other. After they were spotted together at his birthday party last night (September 13th), the Nicki Minaj and Nas dating rumors were kicked up another notch. Neither one of the celebrated Queens rappers have come out and publicly confirmed that they are an item, but with many different reports and social media signs to support that theory, it looks almost inevitable that they would be a legitimate couple. With that in mind, we've compiled a list of everything we know or have heard about pertaining to this potential hip-hop power couple. Let's dive right in! The first rumblings we heard about these two supposed lovebirds was earlier this spring, right after Nicki's rival, Remy Ma, was forced to take her track "shETHER" off of the radio after failing to ask Nas' permission to use that world-famous beat in her song. This was also around the time when Nicki has ended things with Meek Mill, with a reported case of infidelity on his part being what put the final nail in the coffin for the couple. According to a write-up that was circulating at the time, Nas had allegedly hit Nicki up as soon as Meek was out of the picture. The Illmatic rapper met Minaj on the set of the 2012 video "Right By My Side," where they hit it off almost immediately. A promising first sign for both of them. Nicki and Nas sent their respective social media followings into a frenzied state when a picture of the two of them getting all cozy in a NYC eatery prompted intense speculation that they were indeed pursuing a romantic relationship. Nicki didn't exactly friendzone Nas in the caption for the picture either, stating that, "only KINGS recognize QUEENS." At the time, it was also pointed out that the two were wearing the same pendants on their chains, which was taken as another sign of their dating progress. That one photo actually caused a big enough stir that Nas' baby mama was asked how she felt about the whole situation. "I didn't think my baby father still dated women," said Carmen Bryan, who used to date Nas and is the mother to their child Destiny. "I'm used to Nas dating 19 yr olds, I'm actually glad to see him dating a woman," she later added. It's not like Nas, or Nicki for that matter, were waiting on pins and needles for approval from the male rapper's former flame, but that kind of endorsement from an ex isn't necessarily a bad thing in some cases. The real confession (sort of) from Minaj came a little over a week later, when Ellen DeGeneres asked her about the rumored relationship directly. "He's so dope [...] he's such a king," Minaj said of her supposed boyfriend. "We're both from Queens. He's the king of Queens, and I'd like to think I'm the queen of Queens. He's a rap legend, and I have a lot of respect for that. And he's kinda cute too." DeGeneres continued to press the issue, asking the realest question that everyone wanted to know the answer to: "Have you had sleepovers yet?" Nicki surprisingly responded with an affirmative. "We have! I just thought him coming to me was too forward." However, arguably the most popular woman in rap didn't want people's minds to run wild after this admission. "Let me clarify, [I'm] just chilling right now, I'm celibate. I wanted to go a year without dating any men, I hate men. But I might make an exception to the rule for him." Despite laying low and not being seen in public together as much over the course of this summer, TMZ had reported that Nicki was moving on from Meek Mill and was apparently doing so with Nas. 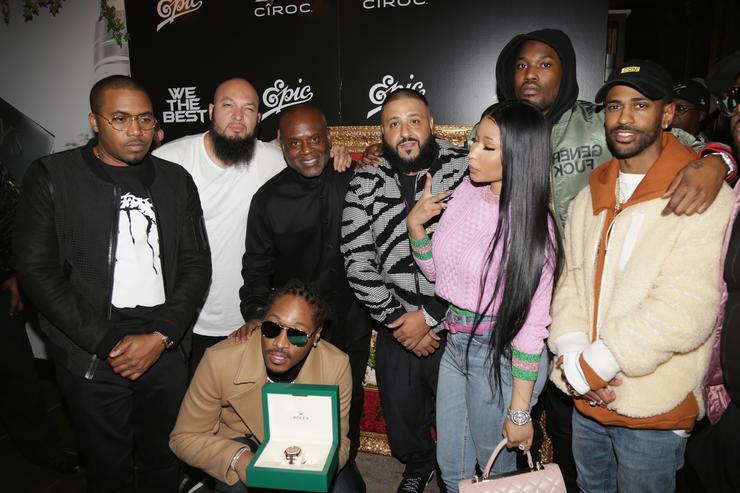 Mill's crew had engaged in some physical chicanery with another one of Minaj's ex's, Safaree Samuels, at this year's BET Awards, where the latter was jumped by multiple people. They also posed for pictures together at the NBA Awards, which was hosted by another rumored love interest of Nicki's, Drake. So many men and so little time, but with all this evidence built up to make the case for them as a couple, it's hard to believe that Minaj has her eyes on any other man besides Mr. Jones at the moment. What do you think? Good couple or total mismatch? Let us know what you think in the comments! A$AP Rocky Promises "New Album Coming ASAP!"